From the Toronto Archives: In 1955 the City of Toronto ran six permanent outdoor artificial ice rinks – High Park, Earlscourt, Alexandra, Greenwood, Eglinton, and Dufferin, There were also four portable (?) 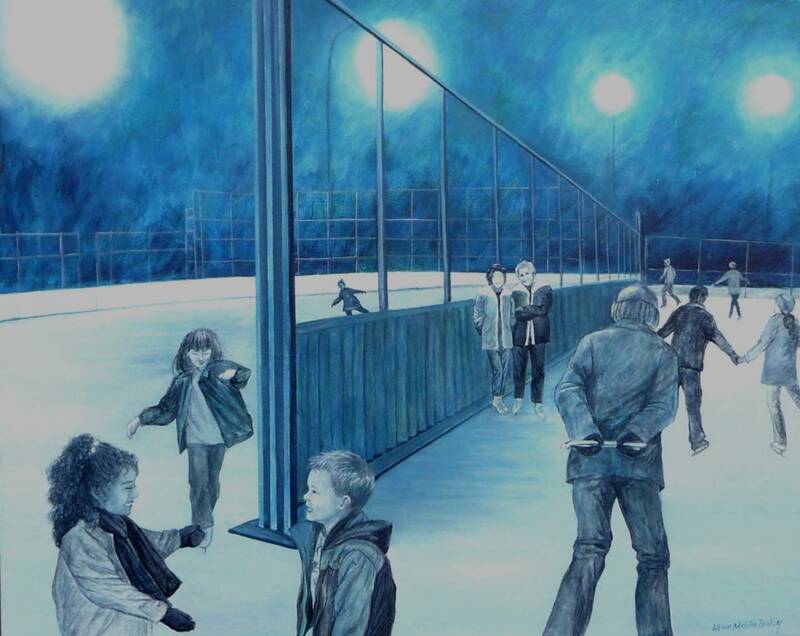 artificial ice rinks – Rosedale, Ramsden, Queen Alexandra School, and Kew. Children were charged 35 cents to skate (adults 60 cents). Skating was popular. As an example, attendance at Dufferin Grove on Sunday Dec.11 1955 was 800. High Park, Eglinton and Earlscourt were even higher at 962, 958, and 861. A Toronto Star editorial on Jan3 1958 grumbled: "If Sardines Skated They'd Choose Toronto." There was a request to provide concessions (snack bars) at Earlscourt and Dufferin rinks. But the request was denied by the Parks authorities. 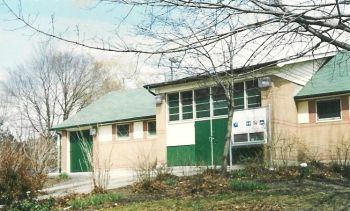 Dufferin Rink was rebuilt from scratch in 1993, for $1.3 million. Some park friends thought then that it might become a kind of neighbourhood meeting ground, a good spot to engage with neighbours in the winter. But at that time, the rink was not a very nice place, and no longer very well attended. 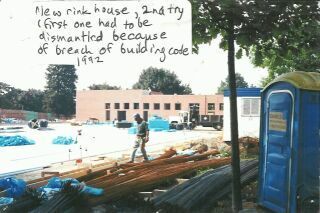 It was a world of mostly male teenagers, rink guard staff included, and there was lots of rough language and bullying. The staff office had a big sealed internal window, through which you could see a beaten-up old metal desk, a few old office chairs and a couple of wooden storage boxes for rink guard vests and cleaning supplies. That office was a little clubhouse for the rink guards and their friends. Much of the time the rink guards were either sitting in the office, along with the ice-resurfacer drivers, or out on the ice playing shinny hockey. 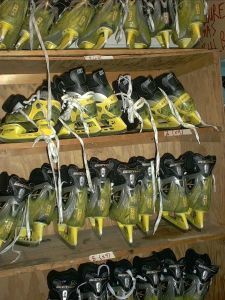 When girls came to skate, there were sometimes raids between change rooms (girls and boys had separate, walled-off skate-changing areas, even though no one actually changed more than their footwear). Shoes were taken as trophies. It must have been fun for the younger kids who liked the screaming and the play-fighting, but for people coming in the front door, the impression could be pretty wild. Meanwhile, out on the ice, older teenagers dominated, and fights were not infrequent. Families seemed to avoid the place. Even though the rink building was new, the fact that there were no eye-level windows gave the place a “prison-architecture” look. (All the windows started three meters up.) Parents couldn’t stay warm and watch their kids out the window at the same time. It was hard for the rink staff to keep an eye on whatever foolishness might be going on in the separate, walled-off change rooms. Attendance was down to a handful of pleasure-skaters on a normal Friday night, and around twenty shinny players – three of them rink guards. What was to be done? The park friends asked Tino DeCastro, our new recreation supervisor, how can we get rid of some of these walls and make a more usable room? He said, talk to the director. So we called Mario Zanetti, and he sent out a building inspector. We showed the building inspector the two concrete-block walls we wanted to be taken out, to make one big, flexible-use room. We asked him – if these walls are removed, will the building fall down? He showed us the big steel beams holding up the roof. The interior walls were not bearing walls. They wouldn’t be hard to remove, he said, but it would be expensive. He estimated that for the City to remove the smaller wall (about ten feet long) that blocked the staff’s view into the girls’ change room would cost $6000. The bigger wall, separating the two change rooms, would cost about $10,000. I can see that it would be a good idea, he said. But you’d better get busy fundraising. We didn’t want to use our time to have bake sales; we wanted to work with families, to get them back into the rink, dilute the youth ghetto, mix it up, bring all sorts of people together. By that time we had a key to the building, and we’d tried to make it as nice as we could, but it was not a pleasant space to be in. Everybody told us – great idea, a clubhouse with one big community room – but taking walls out will cost money that the City doesn’t have. We wondered how you remove a concrete block wall. One weekend a few months before the rink season was set to start, a park friend came with a spike and hammer to try out a technique he had heard about. If you just chip away the mortar, a construction friend had told him, you can lift the block right out and start on the next one. A few of us came over to watch. It was really easy. So we took out the smaller wall. It took four hours for five of us. Suddenly the view into the girls’ change room had opened up. The whole place looked bigger. When we confessed what we’d done, there was some finger-wagging at City Hall. But at the same time we had the impression that the city staff got a bit of a laugh. The story spread. Everyone knew that the change made sense, but no one had thought there was a way to make it happen. The city sent in a carpenter to fix the edges where the wall had been removed. Then we asked for an interior window in the staff office, facing the change room, so that the staff could see what was going on in there. That window was put in by a city crew, without any mention of the cost. We called our city councillor, Mario Silva, to come out and have a look. We asked him, would he be willing to get his Council colleagues to approve money to put four eye-level windows into the outside walls of the rink house, two in each room, so people could see out, and parents could watch their kids out on the ice? And could they be windows that opened, so the building could get some air circulation in the summer? He said, I’ll see what I can do. He came through for us. The city hired two window installers and they had it all done in two days – four windows, each with a quarter section that opened. Suddenly the outside world reappeared, in this formerly sealed-off concrete capsule which had looked so much like a prison holding-cell. The windows were so useful that we knew we had to go the next step. 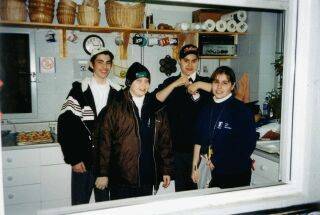 One Saturday morning in October, ten park friends came to the rink with gloves and overalls and dismantled the middle wall separating the two change rooms. It took longer than the first time, to loosen and take down all those blocks – almost 12 hours – but as the wall got lower and lower and the window on the other side of the wall came into view, it was a thrill to see the red leaves of the maple tree outside. 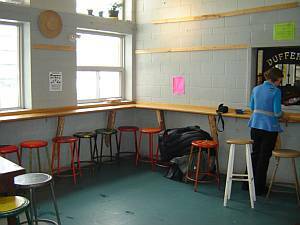 Finally, the rink house was one good room, allowing a community clubhouse. Over the next several years, a few more changes were made, piece by piece as they were needed or as money became available. The window openings were too small to let in much air, so we used a $700 Dufferin Mall donation to get a carpenter to replace one of the windows with casements. The grandmother of a little skater donated a Maytag stove, so the rink house began smelling like cookies baking instead of only stale hockey bags. 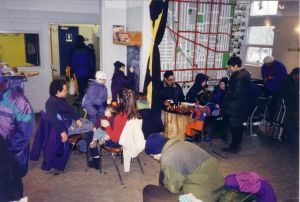 In 1996 the City gave us a “Food and Hunger Action” grant to convert the office, and the slop room across the entry hall, into two halves of a community kitchen. The same year, we sent the Maytree Foundation an old photo from the 1930’s, showing a woodstove in a general store with people gathered around it: would the Foundation be willing to fund a woodstove for the rink house? To our delight, they were willing. When it was installed, the city paid for a little wrought iron fence around it, for safety. The fence had an extra bar for drying wet mittens, used countless times since then. The rink change room’s fluorescent lights were ugly and made people look greenish in the evening, so we begged $1000 of halogen track lights from Home Depot. At first they said no, and then they changed their minds and presented us with the lights on St.Valentine’s Day. The softer, focused lighting made a huge difference in the long winter evenings – people stayed and played chess, and more youth started bringing their dates on Fridays. After skating, they could drink hot chocolate with their girlfriends and watch the flames in the woodstove together. The City was ready to just throw in the towel for that rink season. A lot of efforts went into persuading them to pay for and contract the necessary repairs right away, instead of just staying closed that winter and waiting until the following year. Rink friends made many phone calls. Finally the City did fix the rink -- and once they committed to it, they were very efficient, and we were able to open before Christmas. 300 people signed the thank-you card to the city's project supervisor, Don Eastwood. His boss wrote back that he had been working with the city for over twenty years, and "let me tell you, letters like the one your group sent are few and far between." 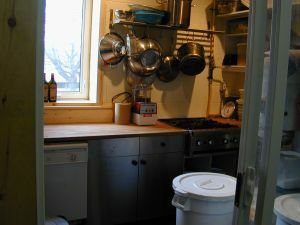 In 2003, the City gave us another kitchen grant to add a second small kitchen in an unused alcove in the zamboni garage. That addition was a bit more complicated, so the G.H.Woods Foundation topped it up with an $8000 grant to let us finish. The second kitchen, called the “zamboni kitchen,” made Friday Night Suppers possible, and its proximity to the outdoor bake ovens reduced the public health officials’ qualms about food safety. In this way the existing 3-month-a-year rink house was changed into a small year-round neighbourhood clubhouse. 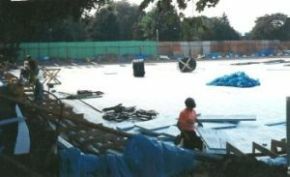 This happened without a middle-man, architect or otherwise – step by step and piecemeal, as useful changes suggested themselves to park users and rink staff, and as City or Foundation money became available. 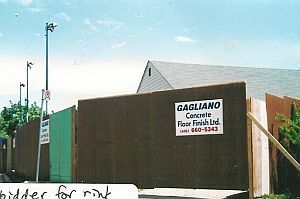 The reason why all these changes were needed was that the building was designed for a single purpose – skating – and even that function was given its narrowest possible range. Skaters were meant to come into the building and change from shoes to skates, then go outside and skate, under the on-and-off supervision of rink guards, then come back inside and change back into shoes and leave. This single-use rink house acquired new possibilities when the changes were made. People came into the rink house and sat down in the big room with their friends, talking and drinking hot chocolate and slowly getting their skates on. Out on the ice, they played shinny hockey for hours. When they got hungry, they could go back inside and eat mini-pizzas or soup, and drink coffee. 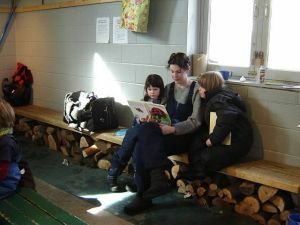 Parents sat in front of the woodstove with their children, reading them storybooks. The old men played card games for hours, and got their coffee for free, “since we worked so hard for this country.” Sometimes musicians brought their instruments, using the echo-y concrete blocks to good effect. There was enough room to fit in a farmers’ market eventually, when it was too cold to have it outside along the path. On those days, the zamboni parked out on the basketball court, to make room for more farmers in the garage. In spring, summer, and fall, the clubhouse became a staging area for dance festivals, outdoor theatre, and cultural events. Park staff and volunteers used the kitchens to turn out snack bar food and Friday Night Supper meals and café snacks and miles of park cookies (if they were laid end to end). All this food became the heart of an ever-expanding number of social encounters, spreading throughout the park. Once in a while, there was even a beer permit and the zamboni café had kegs on the counter. 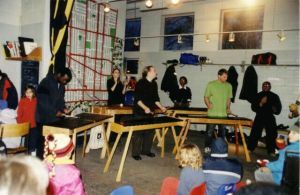 A choir rehearsed in the main room most Sunday evenings, cheering up the dishwasher crews, and giving free park concerts in return for the practice space. Dozens of community groups used the clubhouse for meetings – giving their opinions about installing speed humps in the neighbourhood, about the forced amalgamation of the “megacity,” about bike lanes, about endangered bees. There was room to do a neighbourhood “clothing swap” once a year, and to set up a “tasting fair” with farmers’ market food cooked by local chefs. A few times staff made up a bench-bed for a homeless park visitor. Children painted pictures in the clubhouse on rainy days. Youth came to borrow basketballs or build skateboard ramps. These youth, and younger kids too, knew that they could come into the clubhouse to seek the staff’s protection, if there were bullies or fights. One way that all this liveliness would have been stopped before it could get started is if the City had charged a permit fee for people to use the building, or for programs offered there. But the rink house was an orphan at the start. Nobody (including our little group) thought that the free availability of the space would layer so many activities and encounters on top of each other. It happened because we had more or less unencumbered use of public space: essential for that sociability and new friendships to begin. 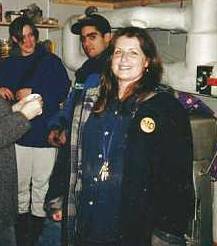 Back in 1995, when Tino DeCastro became supervisor of Dufferin Grove Park, he hired the first mature female staff person to work at the park and the rink in the daytime: Lily Weston. She worked at the rink and the park from 1995 to 2001, and laid the groundwork for the many excellent staff who succeeded her. 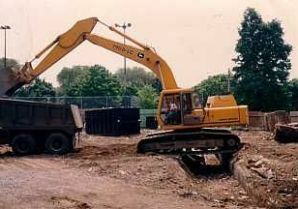 (See the story from the 1995 park report.) But the evening rink staff were still all male. We asked him if he might hire some female rink staff, to balance the mostly-male culture that might be discouraging more girls from coming. He asked park friends if they had any recommendations, and we did. The first female rink guard, Meran Currie-Roberts, was a friendly, capable music student at the University of Toronto, already involved in the park’s summer programs. She was enthusiastic about the rink, and eager to help little kids learn to skate. Meran was a fast learner on her new job, but on her third day of work at the rink she came across a situation she hadn’t expected to run into, and she called a park friend at home. She said that three boys who were probably no older than 12 or 13 had asked her to help them count some money. Meran counted $900 in $20 bills. She asked them where they got the money. One of the boys, who evidently had trouble with strategy as well as arithmetic, told her they got the money from a neighbourhood “chop shop” (auto parts dealer) for delivering a stolen car. Meran said her eyes must have widened. But before she could say anything, the boys looked at each other, quickly got up, and left the building. When she looked outside, there was no one to be seen. Meran said she had been told at the start of her rink guard job that the scene at the rink was sometimes “heavy.” She wanted a candid answer: would she be likely to encounter other kids who would be needing help counting large amounts of money? But no one else ever made that request. Most problem behaviors were more garden-variety. Kids threw checker pieces into the woodstove to fill the room with the smell of burning plastic. Older kids stole lunch money, or baseball caps, from the younger ones. (Everyone called it “punking off,” not stealing.) There was smoking in the washrooms and on the ice – and not only of cigarettes. To get younger kids and families back into the rink, we resolved to have the rink guards enforce the shinny hockey schedule. Older kids would have to get off the ice and let the younger kids play unobstructed for an hour every day. There was strong resistance. Everybody had an opinion. The ice-resurfacing staff came out on the side of the older kids. If the guys have to break up a really good shinny hockey game just because it’s the younger kids’ time, where’s the fairness in that? And so, when the rink guards weren’t looking, the ice-resurfacing staff waved the older guys back onto the ice, with a wink. The resistance heated up. Tino got flyers printed up for skaters to take home. Schedules were put up all over the rink, showing the shinny hockey ice allocation times. When the rink guards passed out the flyers to the older youth, they were met with disgusted looks. Meran, being the first female staff person, became a particular symbol for the new approach at the rink. One evening she found a tow truck parked one foot away from the rink clubhouse’s front doors, so that it was hard to get in and out of the doors. The guys who had arrived in the truck argued with Meran about their right to park the truck anywhere they wanted. As they were talking, they “accidentally” hit Meran in the foot with a puck. Tino came down to the rink from home, and talked to the guys (whom he had known since they were little kids at the community centre) and told them to leave. But they waited at the corner until Meran’s shift had ended, and she had to call a park friend to walk her home. Tino brought in a few more female staff, long-time community centre workers who knew many of the youth. After these women started working at the rink, skaters were sometimes startled, when they came in the rink house doors, to find themselves in the crossfire of a fierce shouting match between the new no-nonsense rink staff and some of the shinny hockey players who were refusing to follow the schedule (or to clean up their language, or to leave the rink when told to go home). Being told to “go home!” if you ignored the schedule or swore at the rink guard was something new. The youth protested that such a thing had never happened when “the rink was theirs.” They were determined to take the rink control back, and would often delay following a staff order to “leave the premises” until they could actually see the staff dialing the police number. Or they would wait even longer, since the police often didn’t show up for a call as minor as “rink users refusing to listen to city staff.” The youth taunted the rink staff, saying that the police were on their side. Rink friends spent many evenings at the rink, talking up the reasons for giving the younger kids a chance to play without having the older kids grab the puck away or run them down. Most skaters agreed. The posse of guys who resisted were not a majority of the skaters, but there were enough of them that the others gave them a wide berth. Nobody wanted to get punched for defending the staff. So Tino called the recreation director, Mario Zanetti, and asked for permission to sign a short-term contract with Intelligarde, a private security company. Mario said yes. That brought results. The next two times when the youth told the rink staff to go to hell, for enforcing the rink schedule, Intelligarde staff arrived within fifteen minutes (their promise) and ushered the resisters out. The third time, near the end of the rink season, the youth brought some of their friends to bolster their numbers. Two Intelligarde staff came in with a mean-looking dog. The youth left, quite quickly. The rink was due to close for the season the next day – and the staff were glad to see the end of those guys, all of them. But on the first day of the next rink season, the staff and rink friends got a surprise. Kids had been pounding on the door for days, asking when the rink would be open. Then on opening day there was a pretty big crowd, with their sticks and skates, ready to get out onto the ice. The staff started right off distributing their rink schedules, as they welcomed back familiar people. Nobody made a face about the schedule. People admired the new café counter that had been added with the city grant, and the hot chocolate in a pot on the stove, and mini-pizzas just coming out of the oven. They said, those rinks are dangerous. We like this one a lot better. We said, those rinks are dangerous because of people like you, acting bad all the time. They grinned, taking “bad” as a compliment, but shaking their heads. We’re different now, Miss. We’ve matured – using the word the teachers repeated all the time at school – and our rink is the best. 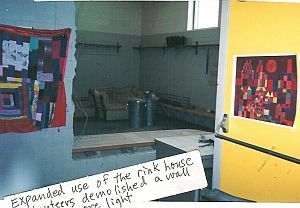 The Dufferin Grove rink house adaptation costs were as follows: Wall-removals clean-up: estimated at $1000. Observation window in office: estimated at $800. Exterior windows: $8000. Casement window: $700. Track lights: $1000. Woodstove: $3500. Installation and cast iron fence: $700. Inside kitchen: $6925. Maytag stove: $750. Zamboni kitchen: $28,000. Total cost: $51,375 ($2500 spent by Parks, Forestry and Recreation directly; the rest, donations, grants, and volunteer labour). Turning the rink into a hospitable neighbourhood space didn’t cost much. A few more windows, a few less walls, some food, staff working together with rink friends, backed up by timely, sustained support from the city supervisor – that was the start. The leading idea was to get away from a monoculture of youth to a mix of all ages and cultures. Then Tino, the supervisor, encouraged rink friends to apply to the NHL Players’ Association for a supply of 50 pairs of loaner skates, sticks, gloves, and helmets. That became the nucleus of a skate lending program which ended the monoculture of tough youth for good. The original rink rats were joined by middle-aged newcomers, and kids who had grown out of their own skates, and wannabe-shinny-player girls, and daytime school visits from all over the area – all of them now had access to skates, for a $2 donation put toward keeping up supplies. Pretty soon the problem of an underused rink turned into a problem of an overcrowded rink, as the word spread about Dufferin. The staff asked rink visitors from other neighbourhoods, why do you travel clear across town to come here, when there are outdoor city rinks right near you? Visitors gave the staff an earful about the windowless, unwelcoming change rooms, poorly maintained ice, officious or sleepy rink guards, pushy shinny hockey players, and unreliable schedules at some of their neighbourhood outdoor rinks. 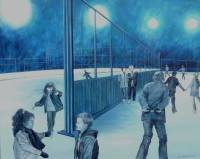 So in 2007, some of the Dufferin Rink staff helped the rink friends to set up a citywide outdoor rink information website, which they called cityrinks.ca. Rink staff made connections with colleagues in other parts of the city, who wanted their rinks to work better too. Patient, sustained pokes at the outdoor rink problems goaded city management into steadily improving their ice maintenance, staying open on holidays, and putting in some windows here and there, especially in the new ‘designer’ rinks that have come into vogue. But at the same time, pressure from City Hall gradually increased, for rink staff to stop making common cause with rink friends. These days, staff working on common projects with “members of the public” risk being disciplined for “conflict of interest.” City councillors, including Ward 18 Councillor Ana Bailao, find it easier to turn a blind eye to this element of our corporate culture. As long as the corporate wall keeps getting higher, though, the Dufferin Rink story will not spread...... and in fact, will gradually fade out even here.